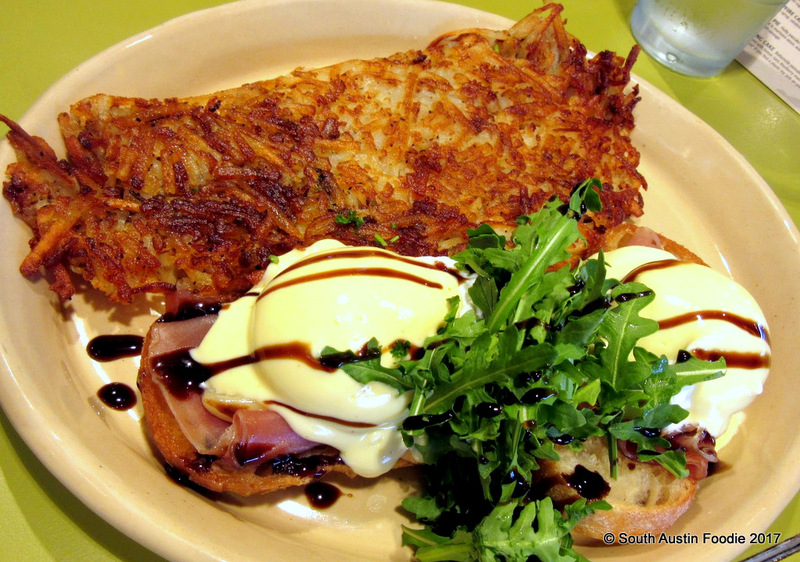 Snooze: An AM Eatery (South Lamar) -- Caught Napping or Wide Awake? I've been pondering this blog post in my mind for over a month now, and it's just time to put it out there. Maybe you can tell from the title of this blog post of the conflict going through my head. 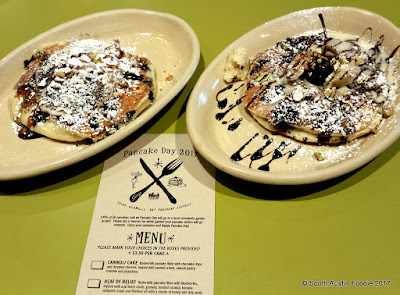 Read on to learn about my first visit to Snooze: An AM Eatery at 1700 South Lamar, which coincided with International Pancake Day on February 28th, where a portion of pancake profits go to help local community gardens. What started out as lunch with friends M and B became a very leisurely lunch, though not entirely by choice. More on that in a minute. Snooze is in a strip center on South Lamar, just north of the light at W. Mary/Hether Streets; its patio seating with orange accents is visible from Lamar. 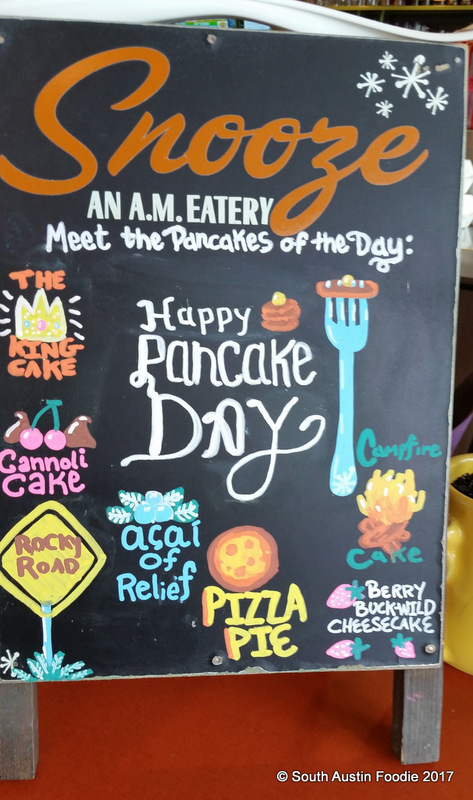 They are open daily from 6:30 am - 2:30 pm, and feature breakfast foods (heavy on eggs) and some sandwiches, as well as a full bar. The original is in Denver, where I ate several years ago when visiting friends; there are now around 20 Snooze locations from Texas to California. I arrived a little after 11:30 am and found the parking lot to be mostly full, but fortunately Snooze was not packed. (I have heard stories about two hour waits on weekends which is one of the reasons I have not gone until now.) I was immediately greeted and seated along the back wall; as I waited for my friends, I admired the playful decor. I don't know what you call the little starburst/jacks thingys, but they are fun and nicely incorporated on the walls, on the glasses, etc. Our waitress was personable and happily made some menu suggestions when asked. 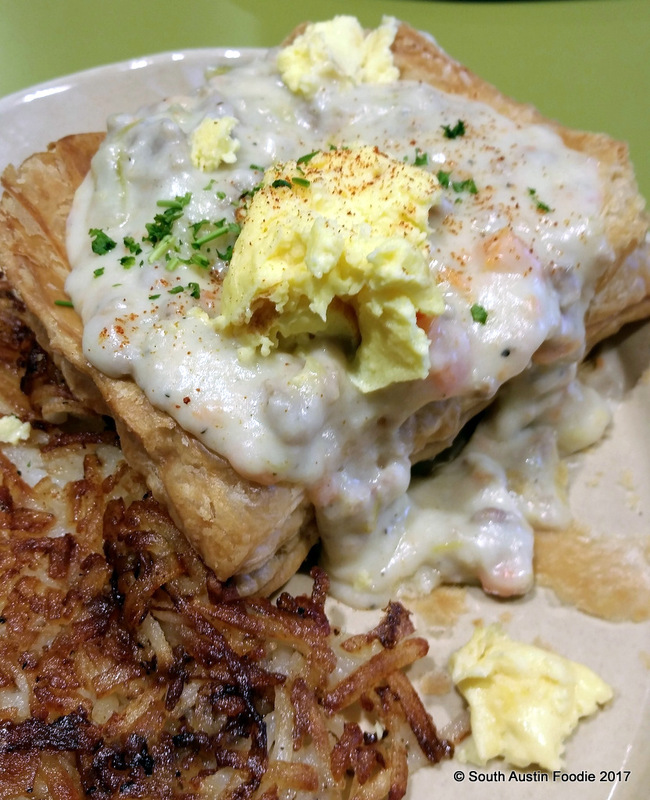 I ordered the Breakfast Pot Pie, which is a big piece of puff pastry, with choice of egg and gravy, along with their very nice and crisp hash browns. 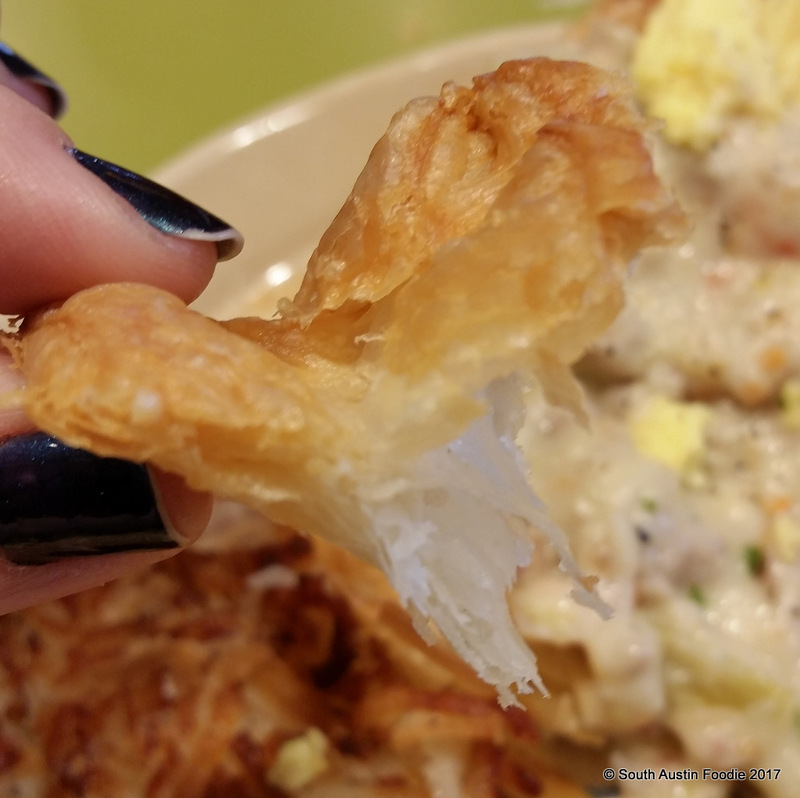 The pastry is probably made from vegetable shortening, not butter, but it's still light, flaky and tasty. This is a good sized plate of food! The food took maybe a little long to come, but nothing egregious. B had the Benny Goodman, with smoked salmon, cream cheese and capers. M had the Bella! Bella! Benny, which the waitress had mentioned was one of the post popular benedicts, with prosciutto, Taleggio cheese, arugula and balsamic. Both of them enjoyed their food. 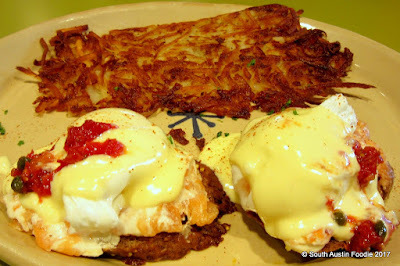 The menu says you can also order a combo plate of any two benedicts if you can't decide, which is a nice option. We all liked our food, and decided to split a couple of the special pancakes for dessert. I can't even remember what we ordered, but I think it was the Acai and Cannoli. So..... 25 minutes go by, and we still haven't received our order, so I asked the waitress when she was nearby. The lunch rush seemed to have peaked and was starting to thin a bit. I saw her go into the kitchen, and another minute or so later, a manager came over. 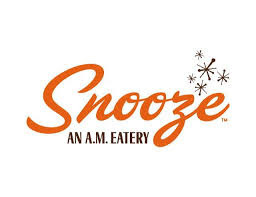 He apologized for the delay and said they should be out in about 5 minutes; he further explained that a lot of his staff was in San Antonio preparing for Snooze's opening down there which was set for the next day or so, and the kitchen was backed up. I told him politely that shouldn't be an excuse for two pancakes. A few minutes later, the pancakes did arrive; I took a bite of each, and they both seemed a bit dry. But then I saw it: there was a long hair in the batter; I was done eating. We pointed it out to the staff but did not make a scene over it. Honestly, I think I was more disturbed by the long wait for two pancakes and what seemed like an excuse than I am about the hair. Don't get me wrong, I am not thrilled about the hair, but it can happen at any type of food establishment from fine dining on down. However, I am sure Snooze will be less than thrilled to know that it happened to a local food blogger. I will say the manager comped us a generous portion of the bill after learning of the incident, and I do appreciate his working quickly to try to rectify the situation. I think I did catch Snooze on a day they were both napping and awake. I will return at some point, though I may still steer clear of the pancakes, but a Dirty Drunken Chai will definitely be in my future. Addendum: I received a press release earlier this week from their PR agency; the two Austin Snooze locations (1700 South Lamar and 3800 North Lamar) donated $2000 to Becker Elementary and the Sustainable Food Center for their gardens from International Pancake Day. Nicely done.